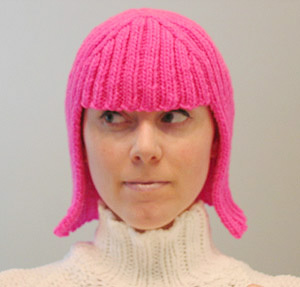 Depending on your knitting speed, you can knit yourself this brightly colored wig for a costume this year. I like homemade costumes much more than store-bought ones. There is something completely unique about a homemade costume that you won’t find at a costume shop. That is so cute! I’m going to pass that along to a knitting friend I know. It would be a cool thing to make for kids (ok, girls) going through chemotherapy, too. I hear ya! I crochet and I haven’t figured out how to do it yet. If you do, send the pattern on to me! I have seen a cat in one of these wigs. Does anyone know where I could find the picture again? I would love to share it with a friend. By the way, I have a friend whose daughter-in-law is going through chemotherapy for aggressive breast cancer. I have offered to knit her one of these wigs if she wants it.